Archaeological evidence reveals that seafood, particularly coral reef species, was part of the customary diet of the earliest human inhabitants of the Hawaii Archipelago. The social and symbolic value of fish reflected early Native Hawaiian traditions is related to the sharing of fish in the extended family and community. 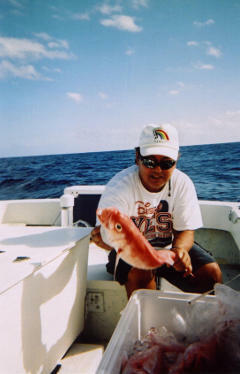 The importance of sharing fish is also found in other ethnic groups in Hawaii. Many of these traditions continue in today’s modern and traditional fisheries. Commercial fishing has been part of Hawaii’s economy for nearly two centuries, and the socio-cultural context of fishing in Hawaii has been shaped by the multi-ethnicity of local fisheries. Fishing gear types that mainly target inshore and coastal pelagic species accounted for about 10% (or 1.5 million lbs) of the mean annual commercial fish catch in the State of Hawaii from 1990 to 1995. The majority of the total commercial, recreational and subsistence catch of coral reef fishes, invertebrates, and seaweed comes from near-shore reef areas around the MHI. The exceptions are bottomfish with over 50% caught from federal waters surrounding the MHI and Kona crab landings (crustaceans) from Penguin Bank. Collection of black corals from depths of 90 to 300 feet by scuba divers continues in the MHI, whereas collection of other precious corals in Hawaii has been dormant. Coral reef species are targeted using numerous fishing gears including nets, traps, hook and line, spear, hand and other methods. Akule (coastal pelagic scads) dominate near-shore commercial landings and are typically harvested using surround or fence nets, gillnets or hook and line. 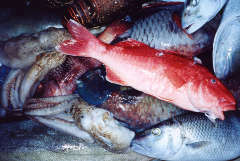 Other top species by weight and value include soldierfishes (Myripristisspp. ), parrotfish (Scarid spp. ), surgeonfishes (including Acanthurus dussumieri, A. trostegusand Naso spp.) and goatfishes (including Mulloidichthys spp.). Inshore fishermen target some of these species (especially the goatfishes Parupeneus porphyreus and P. cyclostomus), since they can fetch a high price in some seasons. Recreational and subsistence catches are not reported in Hawaii, but creel surveys suggest that the total inshore catch from reef areas could be as high as the reported commercial catch. The deep-slope bottomfish fishery in Hawaii targets snappers, jacks and a single species of grouper concentrated at depths of 30-150 fm. The fishery can be separated into two geographical areas: the inhabited main Hawaiian Islands, with their surrounding reefs and offshore banks, and the NWHI. In the MHI about 50% of the bottomfish habitat lies in State waters. Bottomfish fishing grounds within federal waters include Middle Bank, most of Penguin Bank and approximately 45 nm of 100-fathom bottomfish habitat in the Maui-Lanai-Molokai complex. Total bottomfish demand and price have been consistent; however, declines in local landings since the mid-1980s have been supplemented by increased foreign imports. Bottomfishing in the MHI is regulated through permit and reporting for commercial and non-commercial participants and through annual total allowable catch limits for key deepwater species. More information on this fishery can be found here. Bottomfishing in the NWHI is scheduled to end in 2011 per the establishment of the NWHI marine national monument in 2006. The fisheries are healthy and managed through the Council’s limited entry programs put in place in 1989 and 1999. Two species of commercially valuable black coral, Antipathes dichotoma and A. grandis, were discovered in 1958 off Lahaina, Maui, by Jack Ackerman and Larry Windley. Subsequent development of the resource by these two pioneer divers led to the formation of a small black coral cottage industry based on the manufacture of black coral jewelry. The black coral fishery in Hawaii continued to operate on a sustainable basis for over 40 years. Unfortunately, two recent changes in harvesting pressure and the introduction of an alien pest species, Carijoa riisei, appear to threaten the future stability of the fishery. Although harvesting rates have remained below estimates of maximum sustainable yield, they have increased somewhat in the last 10 years. Since 1980, virtually all of the black coral harvested around the Hawaiian Islands has been taken from a bed located in the Auau Channel, and nearly all of the harvest has come from State of Hawaii waters. 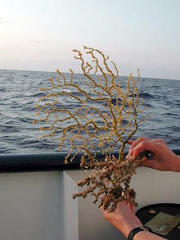 There is a biannual quota of 5,000 kg for the Auau black coral bed. The Hawaiian fishery for Corallium has been primarily limited to a single bed of pink coral (Corallium secundum) at 400 m off Makapuu, Oahu. A total of 8,227 kg of pink coral was removed between 1973 and 1978. During the most recent episode (1999-2000) the permitted quota was not filled at either of the two beds where corals were collected. 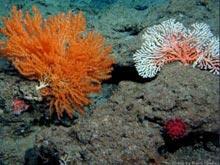 The Hawaiian deep precious coral fishery remains dormant today. The typical species targeted by this fishery are the spiny lobster, Panulirus marginatus, and the common slipper lobster, Scyllarides squammosus. Other important species include Panulirus penicillatus, another spiny lobster species; other slipper lobster species in the family Scyllaridae; and Kona crab, Ranina ranina. The largest crustacean fishery was the NWHI commercial lobster fishery, which began in the late 1970s and ran through the mid 1990s. The fishery operated under a limited entry program, bank specific quotas, observers, gear restrictions and other regulations. In 2000, NMFS closed the fishery due to uncertainties in their population assessment model. The fishery remained closed as a result President Clinton’s subsequent Executive Order establishing the NWHI Coral Reef Reserve, which then became a national marine monument under President Bush’s executive order. Crabs are also an important species for commercial, recreational and subsistence fishermen in Hawaii, with a mean annual commercial value of $182,182 (Friedlander 1996). The dominant species in the catch is kona crab (Ranina ranina) with more than 28,000 lbs. caught annually. By weight, more than 50% of the kona crab are caught on Penguin Bank, which has long been an important location for kona crab net harvests of (Onizuka 1972). The Council has recently added deep water shrimps to the list of species managed under their plan.